Day 10 of 365 days of peace. 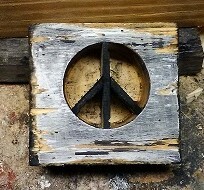 I cut out a circle in a scrap piece of 2×4, painted it white, and then black then cut out lines out of scrap bead board with 45 degree angles on them to make a peace sign. This entry was posted in 365 days of peace, art, on-going projects, repurposeing, scrap wood by brighid. Bookmark the permalink.